Old way to track your expenses daily. Are you tracking your daily expenses with a excel file? Many people used spreadsheet too before switching to other method to control and organize their finances. You can download or access to online sheet or set up yourself a template such as main categories, income/ expenses reports, etc. Then you log to it daily when ever you open your computer like be picture above. If files are deleted accidentally, it's a big problem to start over again. We do not think that works for lots of people now since it could be better with a mobile app on your smartphone. Alternative for expense tracker spreadsheet. In fact, spreadsheet was a old-school, you should track every dollar you spend with a mobile app with ease. Reason why you will love Money Lover without any doubt. Because it works on smartphone so you can log all expense right after you purchase or when you're on the go. You will have to come back home and turn your PC on. You do not need a PC with Excel or connect to the Internet, only a mobile app on your phone to control every thing. Thanks for online storage, you can sync your history with Cloud and use it on any device you have. Money Lover generates reports for you automatically after you log and list your expense under categories. It helps you know where your money goes like total expenses a month or how much you spend on Groceries this week for example. So it's better to understand your spending behavior. In case you log your income, it shows you how much you have left to spend, that make you adjust quickly to keep your budget on the track. Beside record every day expenses, you can plan budgets, track your saving process or get notify about bill on due. 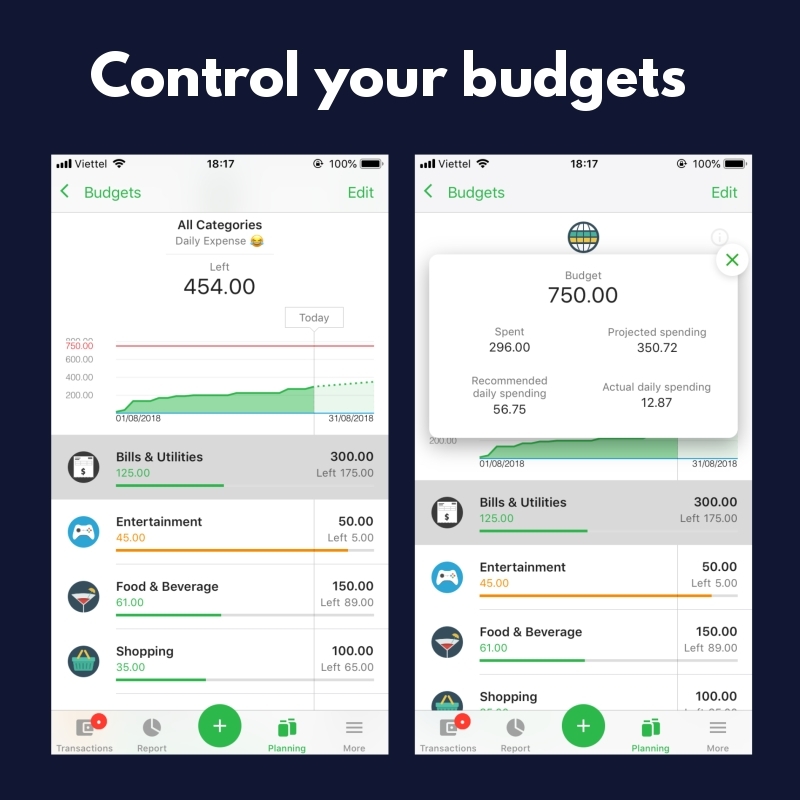 With mobile app like Money Lover, it's much more powerful like a single - personal expense tracker spreadsheet. Forget spreadsheet, and try Money Lover. It's the best expense tracker app on mobile. You can use it on any device, from Android, iOS to Web version. It works seamlessly across platforms. Money Lover was nominated as Best app of 2017 by Google and New App We Love 2018 by Appstore.